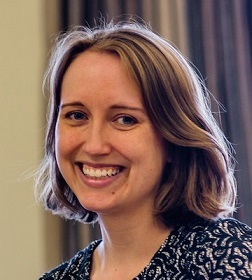 Jenna Lay studies early modern English literature, with specific attention to post-Reformation religious culture, poetry and poetics, female authors, and the intersection of manuscript and print technologies. After receiving her Ph.D. from Stanford University in 2009, she was awarded a postdoctoral fellowship at the University of Texas at Austin. Her first book, Beyond the Cloister: Catholic Englishwomen and Early Modern Literary Culture, is forthcoming from the University of Pennsylvania Press. Beyond the Cloister demonstrates that nuns and recusant women, whom we might imagine as marginal figures because of their gender and religion, are centrally important to an enriched understanding of how literature works in the early modern period and how our own critical perspective has been shaped by the texts at the heart of our canon and by a limited understanding of the expansive literary history that those texts have rendered illegible. The archival work for this project has been supported by fellowships from the National Endowment for the Humanities, the Institute for Historical Research in London, the Huntington Library, the Renaissance Society of America, Stanford University, and Lehigh University.